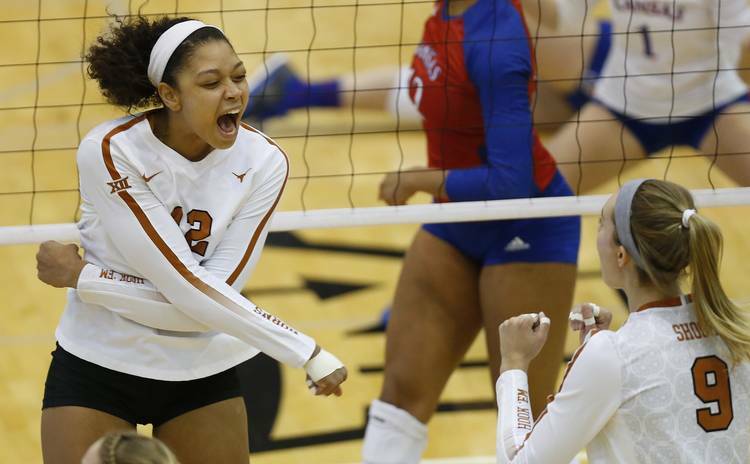 The Texas volleyball team opened this week with some good news. After going undefeated at the season-opening VERT Challenge, Texas climbed to the No. 2 spot in the AVCA’s national poll on Monday. UT was voted into the third slot in the preseason rankings compiled by the AVCA, but No. 2 Nebraska split its two matches at the VERT Challenge. The Huskers tumbled to No. 5 in the poll. Texas earned seven first-place votes and is now ranked behind only Stanford, which it will meet in a home-and-home series during the second week of September. The Longhorns (2-0) are set to travel to Wisconsin this weekend for matches against the No. 8 Badgers and High Point. Leading Texas to its 3-1 and 3-2 wins over Oregon and Florida was senior middle blocker Morgan Johnson, who was named the MVP of the VERT Challenge. Johnson compiled 17 kills and a .375 hitting percentage in her two matches. Her career-high 11 blocks also guided Texas past Florida. For her efforts, the Big 12 honored Johnson as its defensive player of the week on Monday. This marks the fourth time in Johnson’s career that she has been recognized by the Big 12.